Wine is a great beast to try and conquer. Complex, various, elegant, uptight, snobby. Well when you have friends over you need to make sure you can accommodate everyone. 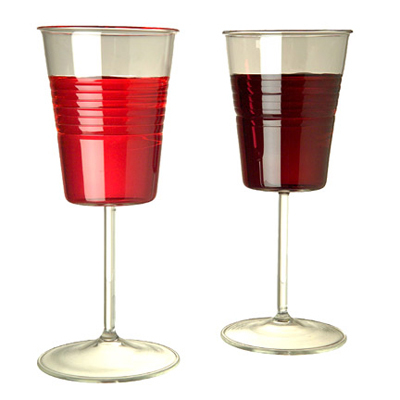 For the snot nosed douche bag who thinks Santa Margherita is the pinnacle of pinot grigios (come on, it is an $18 bottle) you can laugh in his face while sipping some fine Oberon ’94 cab from these fine, hand blown glass solo cups. These glasses are actually very nice and fancy despite their shape. Sure you can drink from some Reidell stemless red wine goblets (barf) or some Waterford Crystal glasses (they sure are nice) but when you got the beer pong cup on a stem, it is definitely the way to go.